Whether you are solo visiting New York City on a budget, are looking for free things for families to do, are enjoying a visit with friends or are on a couple's getawau, there are some excellent opportunities to enjoy some of the best of New York City without spending a dime. You'll want to see NYC from the water, taken in a few museums, and go on a walking tour to learn more about New York City's iconic neighborhoods. The Staten Island Ferry is rumored to be "the cheapest date around." A cruise on the Staten Island Ferry will cost you nothing as you enjoy the hour-long round-trip from Battery Park (South Ferry Subway station) to the borough of Staten Island. During the trip you can experience some of the same fabulous views that the pricier trips offer, including the skyscrapers and bridges of lower Manhattan, Ellis Island and the Statue of Liberty. Check out the weekday or weekend schedules for the ferry and plan your free cruise. A couple of things to note: 1) you will have to get off the boat in Staten Island and get back on, even if you just want to ride back and forth and 2) the sightseeing cruises get much closer to the Statue of Liberty (& include time for a photo-op with the Statue of Liberty behind you) but since this is a commuter ferry, the Staten Island Ferry doesn't get as close or stop for photos. National Museum of the American Indian: The sixteenth museum in the Smithsonian Institution, the national museum works in collaboration with Native peoples of the Western Hemisphere to preserve, study, and exhibit the lives, history, and art of Native Americans. The museum is housed in the historic Alexander Hamilton U.S. Custom House and museum admission is free daily. The museum is located in lower Manhattan on Bowling Green, just a short walk from the Staten Island Ferry. Goethe House: Learn about German life and culture at the library and gallery of the Goethe Institut. Exhibits, lectures, and performances are changed regularly. The museum is located on Spring Street and is open Monday through Friday. Admission to the exhibits and lectures is free. The library is closed Mondays and costs $10 ($5 for students) for year-long access. 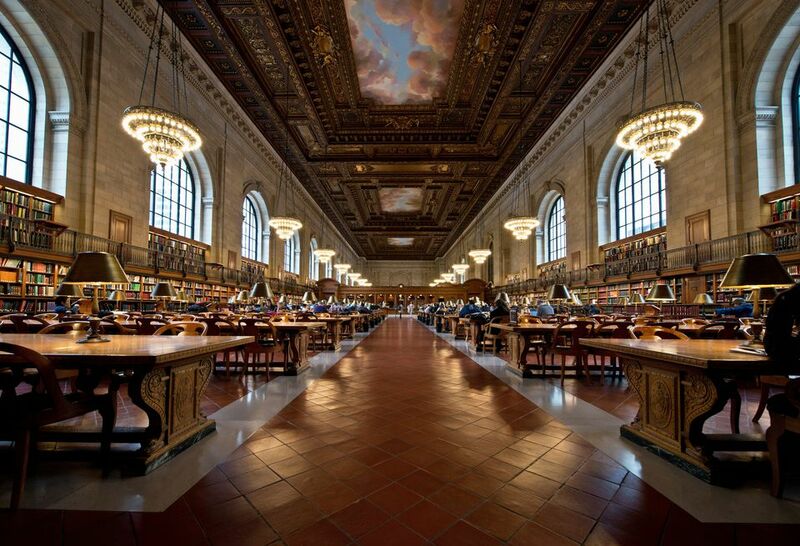 New York Public Library: Entrance to exhibits at the four major Manhattan branches as well as borough branches is free. The various branches of the library are located throughout the city— check out the current exhibit schedule and descriptions to find out what most interests you. Exhibits are as diverse as the libraries themselves—from science, industry, and business to performing arts and the humanities. Cooper-Hewitt, National Design Museum: The only U.S. museum dedicated to contemporary and historic design is open free to the public on Saturdays from 6-9 p.m. Located on museum mile at 91st Street and 5th Avenue, the museum is open daily except for Thanksgiving, Christmas and New Year's Day. In addition to the permanent collection, there are changing exhibitions. See the list of Free and Pay-What-You-Wish Days at NYC Museums for more ways to enjoy the museums of NYC on the cheap. One fun and free walking tour is available every Friday at 12:30 p.m. Meet the guide at the Sculpture Court at 120 Park Avenue (southwest corner of East 42nd Street). You'll be treated to a wonderful tour of Grand Central Station and the surrounding neighborhood. The 90-minute tour also includes many neighborhood highlights, including Pershing Square and the Chrysler Building. Walking offers you the opportunity to see and experience a neighborhood up-close and learn about the people and places that make it unique. These free walking tours cover a variety of neighborhoods, as well as two of New York City's great parks—Central Park and the High Line. Free tours tend to attract large groups, so you're not going to get the same intimate experience you might experience some of New York City's best walking tours, but you can't beat the price.